The business-school numbers are in and they aren’t pretty. Applications for two-year, full-time M.B.A. programs that start this fall declined for the fourth year in a row, according to new data from the Graduate Management Admission Council, which administers the Graduate Management Admission Test. The median number of applications world-wide fell 22% in 2012 for the two-year degrees, after a nearly 10% decline last year. For many programs, the losses are off of multiyear highs that occurred as young professionals sought refuge and new skills in academia amid the financial crisis. But prolonged economic uncertainty is leaving many prospective students wary of the significant investment of both time and money required for a two-year, full-time program. The GMAC survey included 744 M.B.A. and other business programs at 359 schools world-wide. Some top schools experienced sharp declines. Columbia Business School posted a 19% drop in applications to its flagship two-year master of business administration program this year, after four years of rapid growth. Noting that the decline comes off large gains, Amanda Carlson, assistant dean of admissions, said an improved employment market kept many would-be M.B.A.s from leaving the workforce. 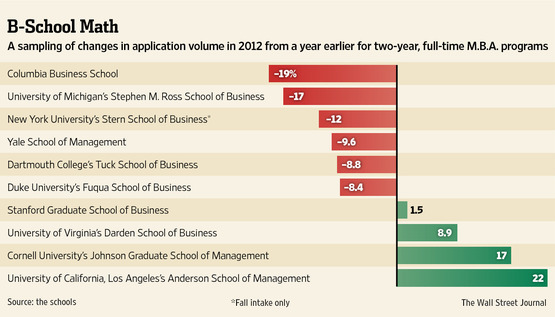 Overall, 62% of U.S. schools reported declines in applications to two-year M.B.A. programs. The picture was different abroad: Some 79% of two-year degree programs in the Asian-Pacific region and 80% of those in Central Asia experienced application gains as more locals sought graduate certifications and international students considered the region’s strong job markets and economic opportunities. Part-time, online and executive M.B.A. programs also reported gains globally, benefiting from workers who want to earn advanced degrees without having to leave their jobs. Applications to the evening and weekend part-time M.B.A. program at University of California, Berkeley’s Haas School of Business rose 11% this year. The school said it has experienced increased interest from applicants outside the San Francisco Bay area, due in part to its growing national profile. Bloomberg Columbia Business School posted a 19% drop in applications to its flagship two-year master of business administration. 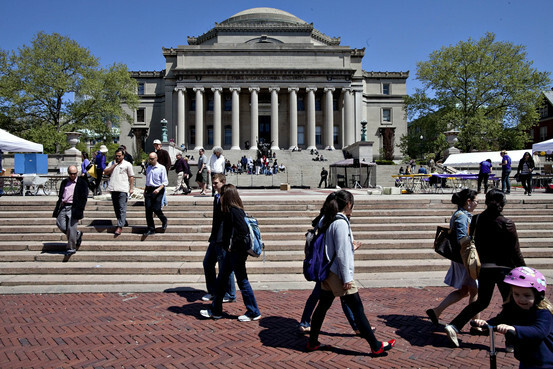 Above, the students walk in front of Columbia’s library. Class sizes, too, were a mixed bag, as some schools saw a higher yield, or the percentage of students accepting offers of admission, while others cut back after particularly large classes last year. While applications to the Yale School of Management’s M.B.A. program fell 9.6% to 2,554 this year, the school’s full-time M.B.A. class size increased 9.7% to 249. UCLA’s Anderson School of Management trimmed its full-time M.B.A. class 4% to 359, as its applicant pool increased 22% to 3,335. And Dartmouth College’s Tuck School of Business said applications to its M.B.A. program fell 8.8% to 2,502, as the class increased 6% to 282. That school’s M.B.A. application pool rose and its class size shrunk last year, and both are now on par with 2010 levels. Globally, most M.B.A. programs reported plans to increase their class size, according to the GMAC survey. Specialized master’s programs had a strong showing, with about three-quarters of management, accounting and marketing-and-communications degree programs reporting application increases in 2012. Those programs, which generally cater to students straight out of college, have gained popularity as undergraduates clamor to bolster their credentials before hitting the job market. A version of this article appeared September 17, 2012, on page B1 in the U.S. edition of The Wall Street Journal, with the headline: B-School Applicants Decline for Fourth Year.